The Carolina Hurricanes have been holding onto three goaltenders since the start of the season. With injury issues that may have been a good idea, but that could change soon as head coach Rod Brind’Amour said that with Petr Mrazek not 100 percent and it not being “fair” to use Curtis McElhinney in both games of the back-to-back set, the team will start Scott Darling. News & Observer’s Luke DeCock writes that this start has a last-chance feel for Darling. While many people felt that Darling would have a bounce-back season after a disastrous first year as the Hurricanes’ starter, that hasn’t happened. While splitting time with two other goalies, Darling has appeared in just six games with a 2.99 GAA and a .903 save percentage. While McElhinney and Mrazek likely would be claimed off waivers by some goaltending needy NHL team, it’s unlikely that Darling would after he signed a four-year, $16.6MM contract last summer, which no team would likely want to take on considering his struggles. In a mailbag piece, the Washington Post’s Isabelle Khurshudyan writes that while the Washington Capitals did extend Lars Eller during the middle of last season, don’t expect the same treatment for restricted free agents Jakub Vrana or Andre Burakovsky. While the team’s extension of Eller got them a cheaper price than they would have had to contend with had he hit the open market this summer, the team will likely want to wait and see how both players fare before handing out new contracts considering how tight they will be against the salary cap over the next few years. Vrana has been having a solid year up till now as he has six goals and 14 points in 23 games, which will likely have him headed for a career year. Burakovsky has just three goals and six points in 23 games as well. NHL.com’s Michael Smith writes that Carolina Hurricanes defenseman Haydn Fleury has been diagnosed with a concussion, according to Brind’Amour. The 22-year-old was forced out of the team’s game during the third period Friday against Florida after taking a hit from Troy Brouwer. He will join the NHL concussion protocol and remain sidelined until he’s medically cleared. Fleury has served as an extra defenseman for most of the year after playing in 67 games last year. However, the seventh-overall pick in 2014, has not been able to seize a regular rotation spot and has played in just eight games this year. He’s also played four games for the AHL’s Charlotte Checkers. Philly.com’s Sam Carchidi reports that Phildelphia Flyers general manager Ron Hextall gave an update on the team’s goaltending injury situation as Brian Elliott is expected to be at least a week away, maybe more, while Michal Neuvirth is closer to returning and is expected to skate with the team on Monday. Alex Lyon tweaked something in warmups before allowing four first-period goals on Wednesday. He is expected back soon. “That’s the way it goes, and if you look around the league, we’re not the only team it’s happening to,” Hextall said. For the first time in 44 years, the Washington Capitals are Stanley Cup champions. The 1974 expansion team won the first title in franchise history with a 4-3 victory over the Vegas Golden Knights in Game Five. The long-suffering fan base that has seen more President’s Trophies than Conference Championships in the team’s history can finally breathe a sigh of relief and celebrate their team getting over the hump. The Stanley Cup belongs to the Capitals in 2018. Leading the charge for Washington in the postseason and in the deciding game was of course Alex Ovechkin. The franchise leader in scoring fittingly led the team in playoff goal scoring and set the franchise record for goals in a playoff by notching his 15th en route to a win the first title in franchise history. Evgeny Kuznetsov led the team with 32 points in the postseason, adding an assist in Game Five and leading all forwards in ice time. Lars Eller potted the game-winning goal mid-way through the third period to cap off an excellent postseason in which he took his game to the next level and was a clutch presence for the Capitals. Of course, none of this would have been possible without the play of goaltender Braden Holtby, who won back the starter’s job early in the postseason after a tough regular season and went on to make brilliant save after brilliant save these past month, especially in the Final. 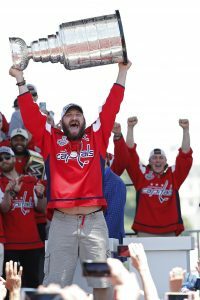 Not to be forgotten are key contributors like long-time Capitals Nicklas Backstrom, John Carlson and Jay Beagle, T.J. Oshie, Matt Niskanen, and Brooks Orpik among others. Head coach Barry Trotz should also be commended for his excellent work and on a career that, like his superstar forward, has always lacked one thing: a title. Not anymore, as Trotz and the Caps are champs. However, this win is also about the players that came before this team who have long waited for a title to come to Washington. Peter Bondra, Mike Gartner, Dale Hunter, Olaf Kolzig and others can all enjoy what this team has accomplished and what the last four decades have led to. The achievements of George McPhee, Gerard Gallant, and Vegas Golden Knights, an expansion team in their inaugural season, cannot possibly be overstated. Yet, this franchise has a bright future and is unlikely to have a long wait for their own title. Washington fans had waited long enough. After 44 years, the Washington Capitals are champs and D.C. is a title town once again after 26 years. Friday: Amazingly, Kuznetsov is on the ice at the Capitals option skate this morning. No word on whether he’ll play tomorrow, as Trotz still claims he has not been cleared to return to game action. Thursday: The Washington Capitals came away with a big road win in Game Two of the Stanley Cup Final last night, but they also lost a key contributor in the match-up. The postseason’s leading scorer, Evgeny Kuznetsov, was forced out of the game early after he was the recipient of a hip check into the boards from Vegas Golden Knights defenseman Brayden McNabb. Speaking to the media earlier, head coach Barry Trotz offered no update on Kuznetsov’s condition, other than to say that he is “day-to-day” with an undisclosed upper body injury, reports Isabelle Khurshudyan of The Washington Post. Trotz seemed unsure if Kuznetsov would be available for Friday’s practice as he deals with this injury, but hopes to give a more educated update tomorrow. The hit in question (video) seems to show the brunt of the impact landing on the right elbow and forearm area of Kuznetsov. If Kuznetsov suffered a break of any kind in that area, it would severely limit his stick-handling ability and would likely mean the end of his season. If he cannot return in the series, it would be a major blow to Washington’s Cup hopes. Kuznetsov has 25 points this postseason, including eleven goals, and had been on an 11-game point streak as well. Should the Capitals go on to win the series, the 26-year-old center would likely be one of the favorites to win the Conn Smythe Trophy. For what it’s worth, Kuznetsov’s teammates do not seem overly concerned about his availability. Alexander Ovechkin told Khurshudyan that he’s “sure he’s going to be fine”, while Nicklas Backstrom offered an open-ended “We’ll see what happens”. If Kuznetsov does miss any time, it is also comforting to Washington players, personnel, and fans alike that Lars Eller performed well when he was forced to take over Kuznetsov’s ice time last night. Eller’s tenure in Washington has not been without bumps in the road, but he has taken his play to a new level in these playoffs. It would not be easy to fill the shoes of the postseason’s most dangerous forward, but Eller seems to be up for the task if called upon. Don’t expect the Washington Capitals to be “all in” at the trade deadline like they have been in recent years. While the team sits atop the Metro Division once again, it is believed that general manager Brian MacLellan is taking a more measured approach to this season. A good, but not necessarily dominant team that has very little cap room to wiggle with, the Capitals are making a lot of key decision with next season in mind as well. 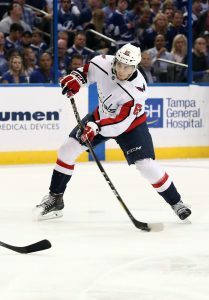 The extension of center Lars Eller Saturday was a critical move for MacLellan, who needed insurance the team wouldn’t have to replace a center next season, according to the Washington Post’s Isabelle Khurshudyan. If they hadn’t made that move, then the team would have been looking for a future center via trade using more of the team’s assets. The team has now started contract negotiations with pending unrestricted free agent John Carlson, which is their top priority. Depending on how negotiations go will have an effect of whether they pursue a blueliner at the trade deadline if they feel they can’t sign Carlson to an extension. In the same story, Khurshudyan writes that with Eller on board and if the team manages to extend Carlson, that could likely end the tenure of veteran center Jay Beagle. The 32-year-old fourth-line center has been with the Capitals for his entire career, but will be an unrestricted free agent next year. He has six goals and 11 assists in 54 games. He had a career best 13 goals and 30 points last year and currently makes $1.75MM. Khurshuyan also adds that the team is likely to trade backup goaltender Philipp Grubauer this summer. With starting goaltender Braden Holtby still under contract for another two years after this one, Grubauer has become expendable. The 26-year-old is ready for an increased role, which the team cannot provide. The backup will be a restricted free agent next year and should make quite a bit more than the $1.5MM he makes currently.